The Attack on Titan Mod, created by the developer: “JammersXAM”, adds in some new mobs to the game. Specifically, the mod adds some aggressive giants to the game. However, usually when ‘giants’ are added they are around ten blocks high, but in this mod they are of varying size. The mobs are very hard to kill and will hunt you down no matter what. So what are you waiting for, download this stunning mod today. 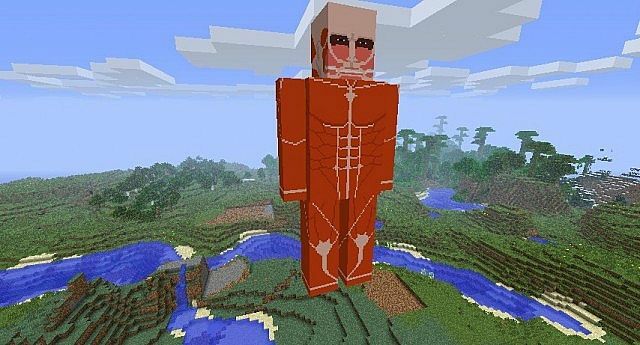 There is no real way to use the Attack on Titan Mod you first of all need to download it with Minecraft Forge and then you can load up your latest save game. When loading all of the mods features should be automatically enabled. There are currently no video showcases of this mod, it’s very simple to use however! The mod adds up to three new types of giants to the game. They come in varying sizes and are very aggressive. The largest giant in the mod is up to 64 blocks in height, and is excessively hard to defeat. Compatible with Minecraft Forge and available to install for servers. Next, download the Attack on Titan Mod and drag and drop it into the .minecraft/mods folder of your Minecraft directory. There are currently no public changelogs for the Attack on Titan Mod. The developer has only just recently released this small mod and there are also no features planned for the future. So it seems to be all quiet on the update front.